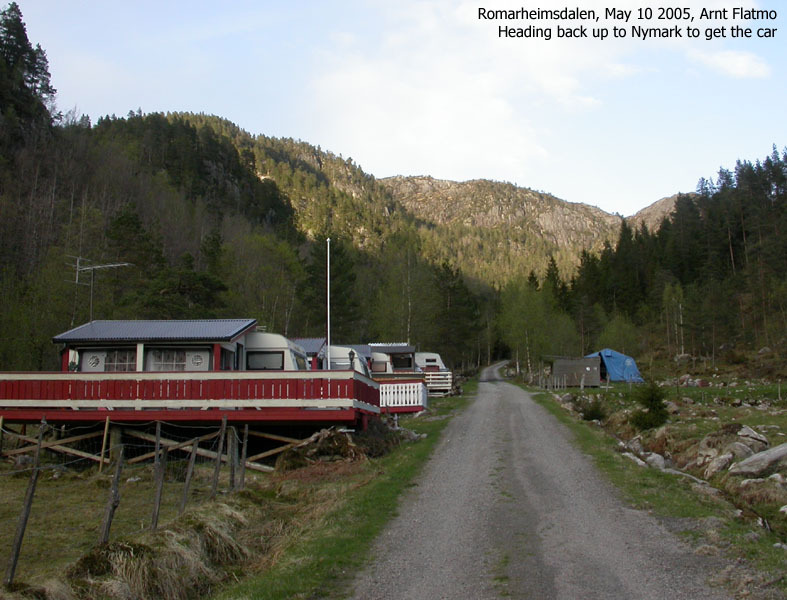 Storlifjellet is located between Romarheimsdalen valley and Mofjorden and is the very beginning of a mountain ridge that merges into the vast Stølsheimen mountain range. 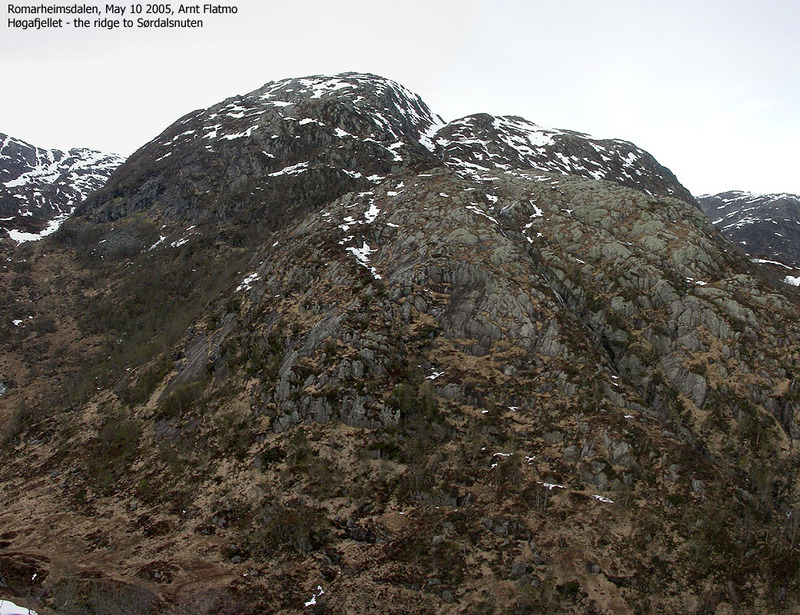 Another way of looking at it is that Storlifjellet is the end of Sørdalsnuten's (highest mountain in Lindås kommune) south ridge. Husafjellet is a hump on the ridge towards Høgafjellet/Sørdalsnuten. 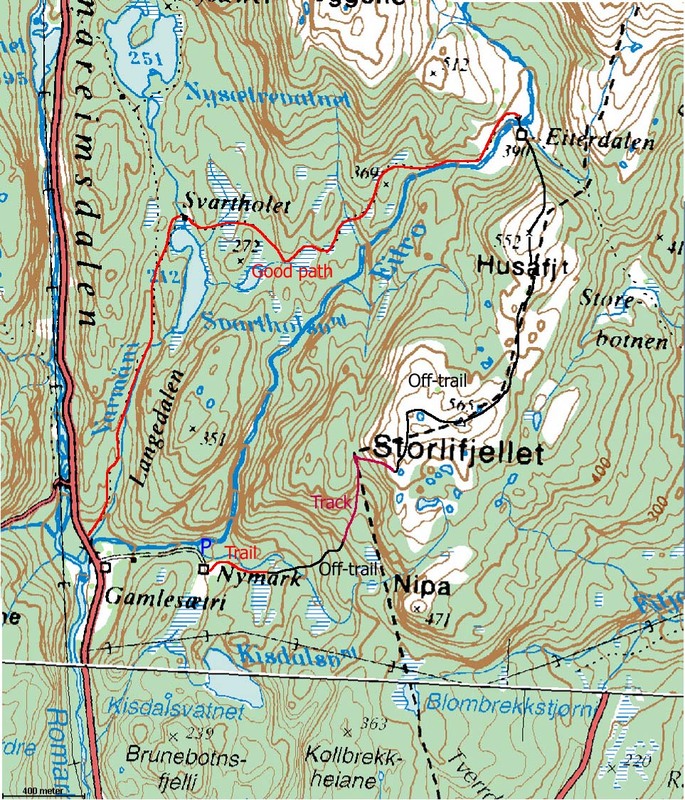 The Lindås/Modalen kommune border runs across Storlifjellet's summit, while the border runs just east of the top of Husdalsfjellet. 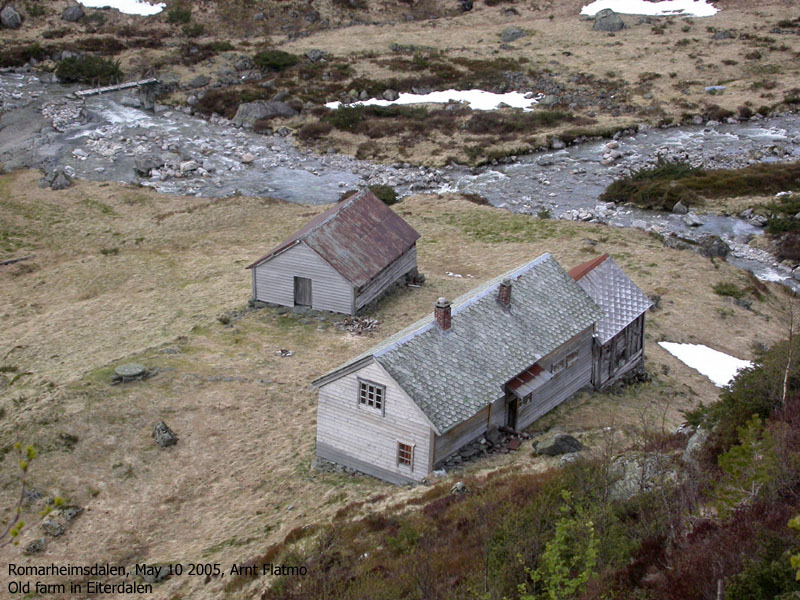 However weird this might be, I am considering Husdalsfjellet to belong to Lindås kommune. 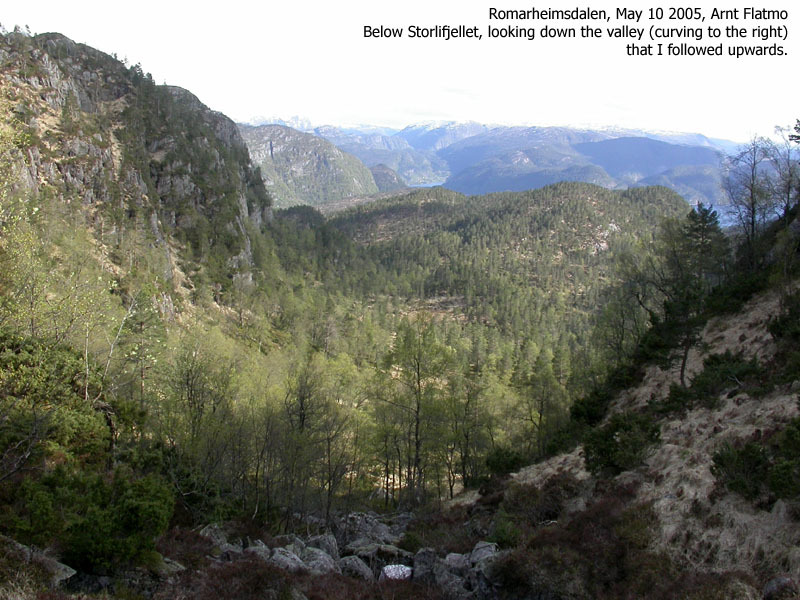 Storlifjellet offers fairly good views, especially towards Osterøy in the south. It is surrounded by higher mountains to the east, north and west, but these mountains can be nice to look at, as well. On this web-page I am describing a round trip that has varying characteristics. 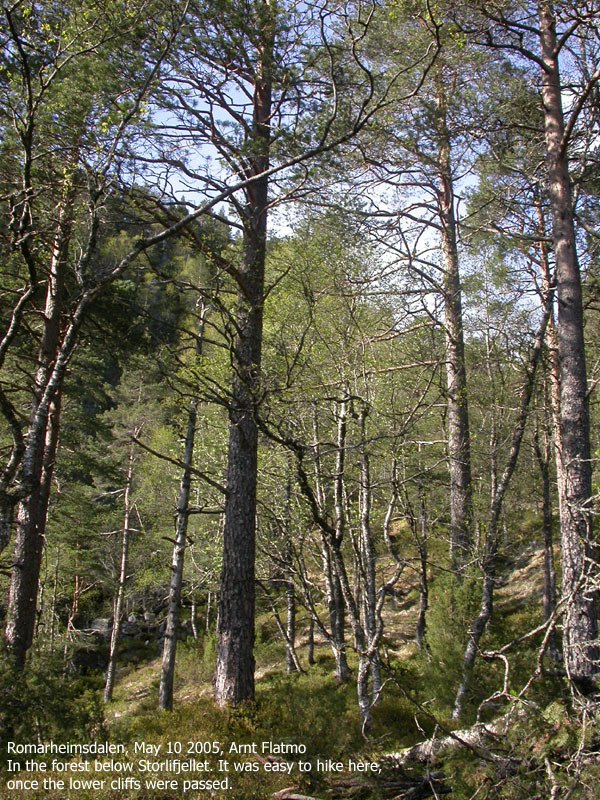 The round trip begins with a forest trail, continues with off-trail walking in the forest before you rise above the forest. Off-trail descent down to Eiterdalen and a good old, well worn path back towards highway E39. 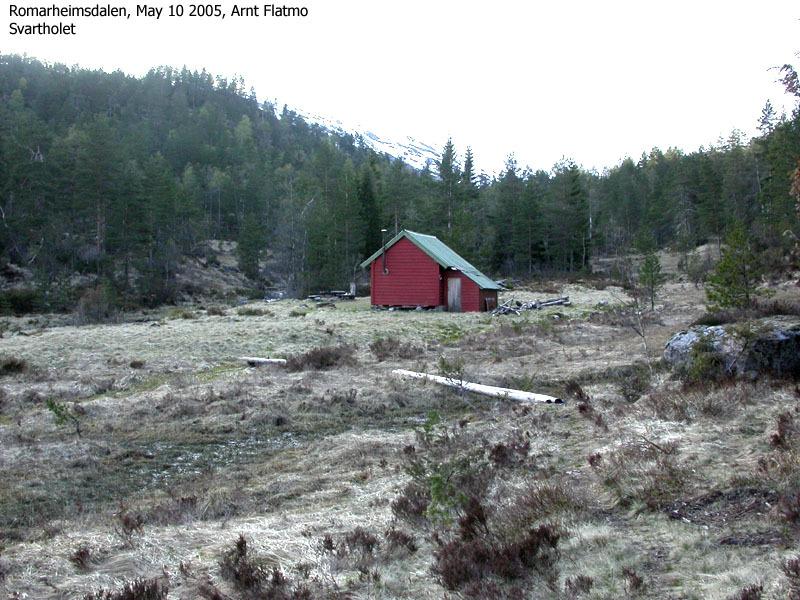 The walk down Eiterdalen involves boggy meadows, dry paths, waterfalls, cabins, bridges, rivers and more. It is a round trip walk that I am sure you will enjoy if you are in reasonable shape. The hike is probably too long and awkward for children, although I'll never stop being surprised how far they can walk when fully motivated. 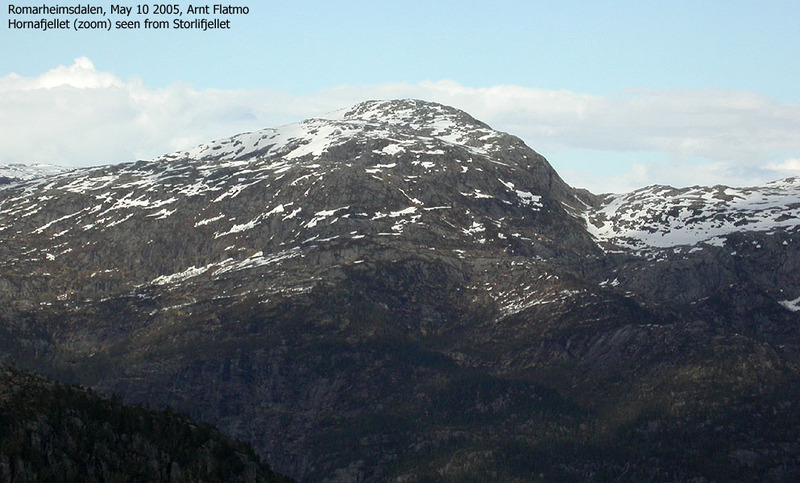 Storlifjellet (M711: 565m, Ø.K: 565,39m) has a primary factor of 112m towards the higher Sørdalsnuten (957m) The saddle is found in Dalaskaret pass (Ø.K.). Ref. 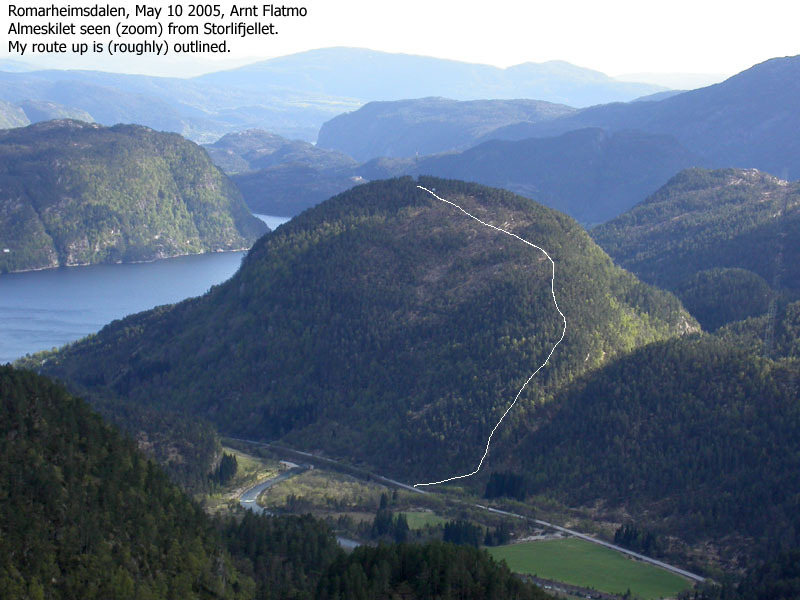 Økonomisk Kartverk (5m contours), you cross the 455m contours on the high route, but not 450m. The saddle height has been interpolated to 453m. 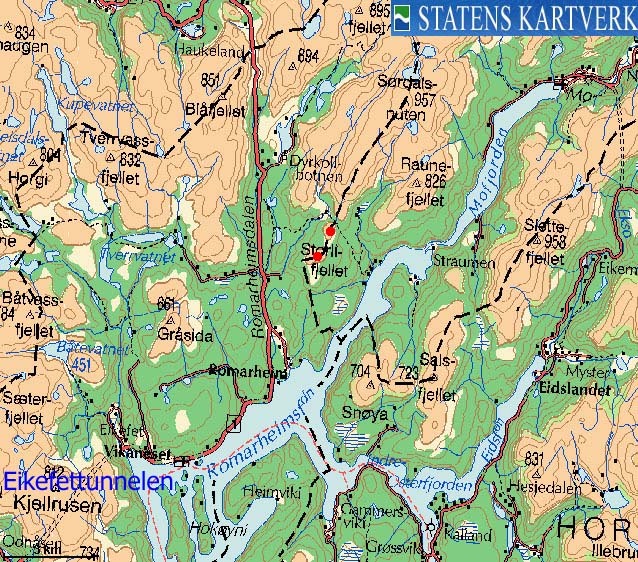 Husafjellet (M711: 552m, Ø.K: 549m) has a primary factor of 61m towards the higher Storlifjellet (565m) The saddle is found in a pass between the two mountains. Ref. the M711 map (20m contours), you cross the 490m contours on the high route, but not 485m. 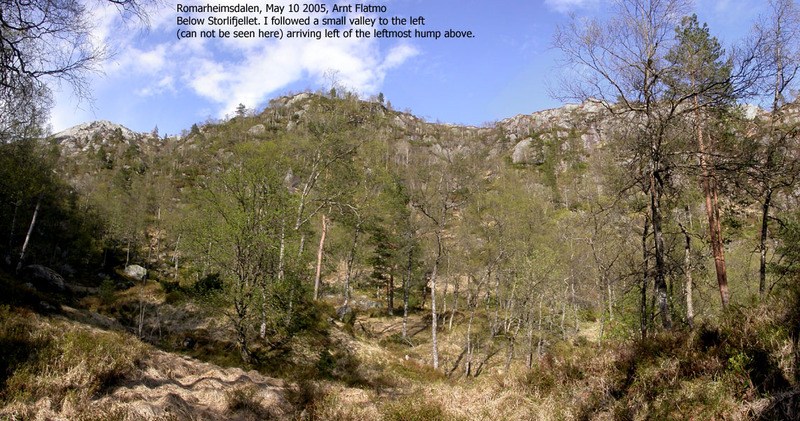 The saddle height has been interpolated to 488m. 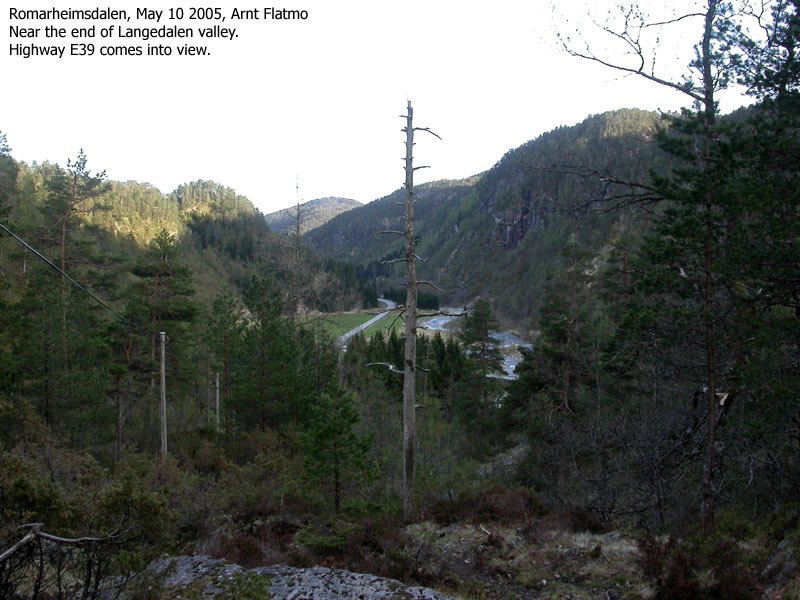 From Bergen, follow highway E39 northbound towards Førde. 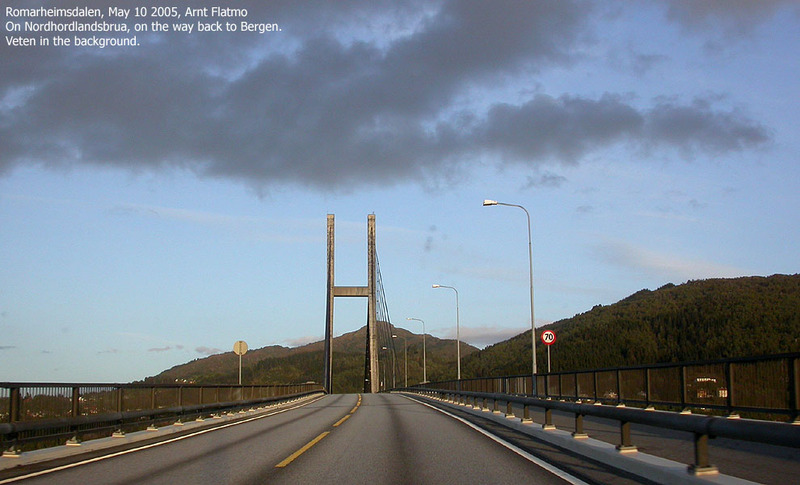 Pass the toll station on Nordhordlandsbrua (fee for passenger car per May 2005 is NOK 45,-) and continue 41,4Km northbound (the Stusdal exit is 400m further up the road). Turn right onto a narrow road that passes a farm. Follow this road 550m up to Nymark. Park outside the gate. Follow a visible trail along the river. This trail ends after 400 meters. Walk up the forest and follow the terrain where it is easiest. Aim for a distinct pass (although hard to see from down in the forest) leading up towards the mountain. 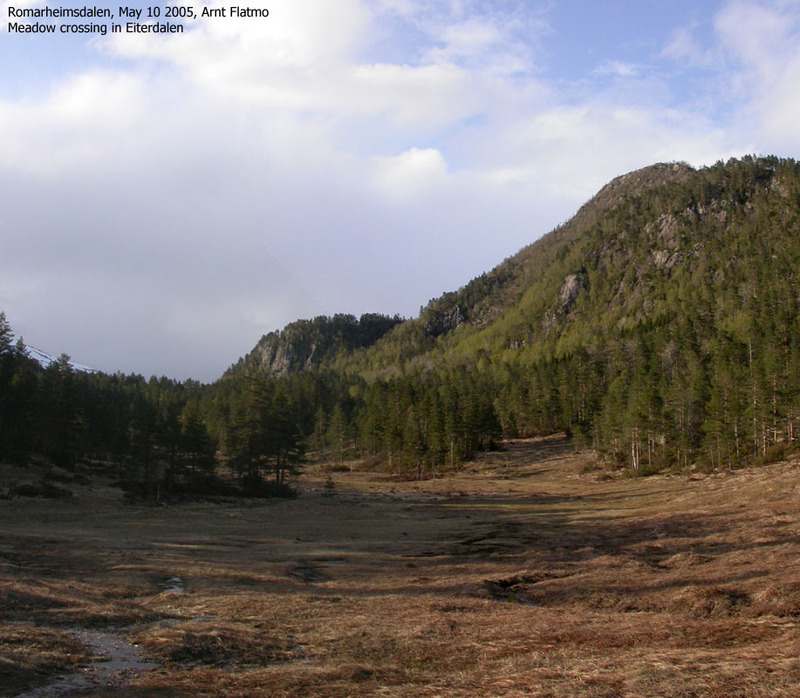 There are several passes, but it is the one closest to Storlifjellet you need to aim for. 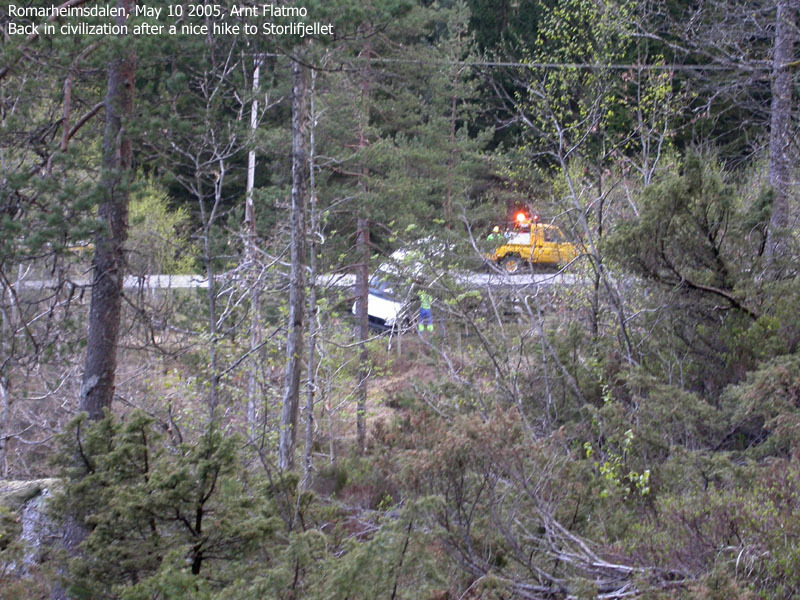 Don't turn left too soon, or you will run into steep terrain. You need to advance a couple of smaller plateaus before you get to the valley leading up to the pass. 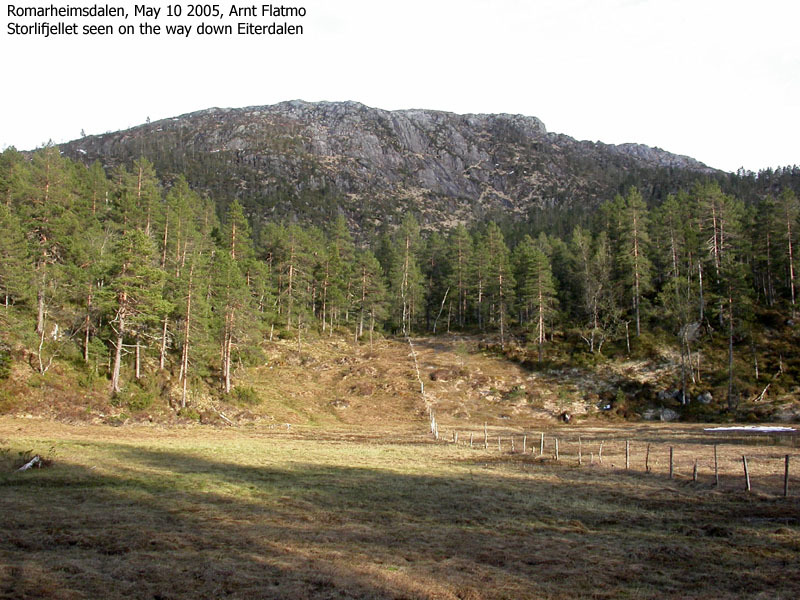 Once in the valley you will probably see a visible track that leads upwards. In the pass, turn sharp right (at this point, you can't see down the other side of the pass. Almost, but not quite). Head straight east into what becomes steep terrain. Locate a very convenient route up this side. You should see a track up here. Once above this point, you are on the high mountain and the route up to the summit (the first high top you see is a false summit) is trivial. Proceed along the ridge towards Husafjellet. You will need to turn left and right, go up and down along this ridge. There are a number of humps and bumps. 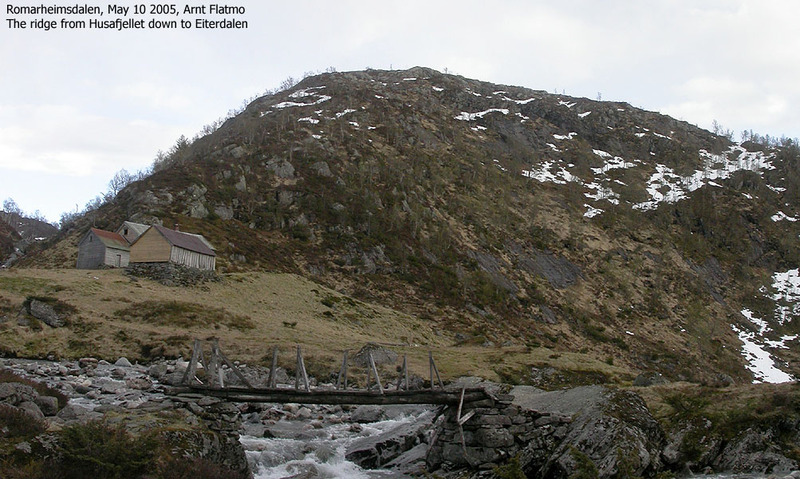 Once across the high point, begin you descent towards Eiterdalen by following the north ridge down to the old farm in Eiterdalen. Cross the river via bridge just behind the farm. The trail back to highway E39 is in general very visible and well worn. You will need to cross a couple of meadows where the trail is not seen. The thumb of rule is to find the shortest route across. Use the map to make sure you are heading in the right direction. 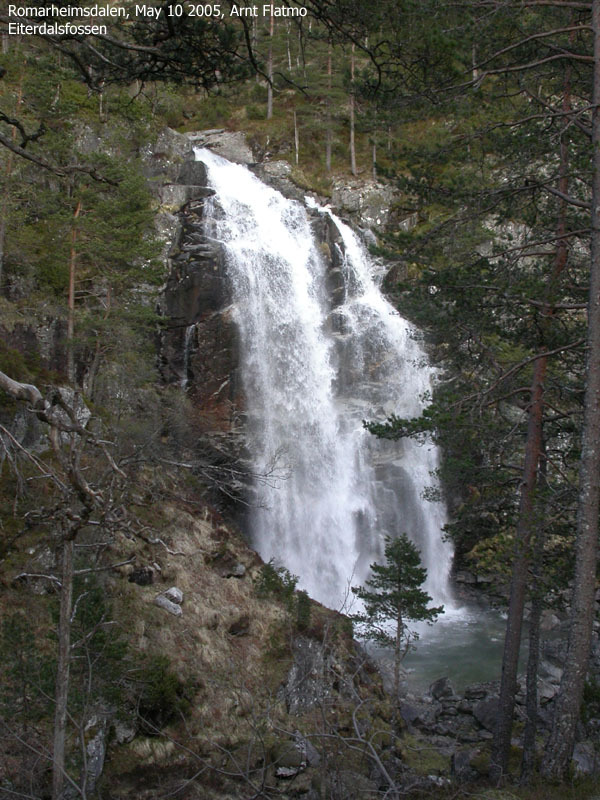 Stop by the Eiterdalsfossen waterfall. You see it on your left-hand side 1,2Km after the bridge. Svartholet is a good place to rest. You will find a table and benches there. 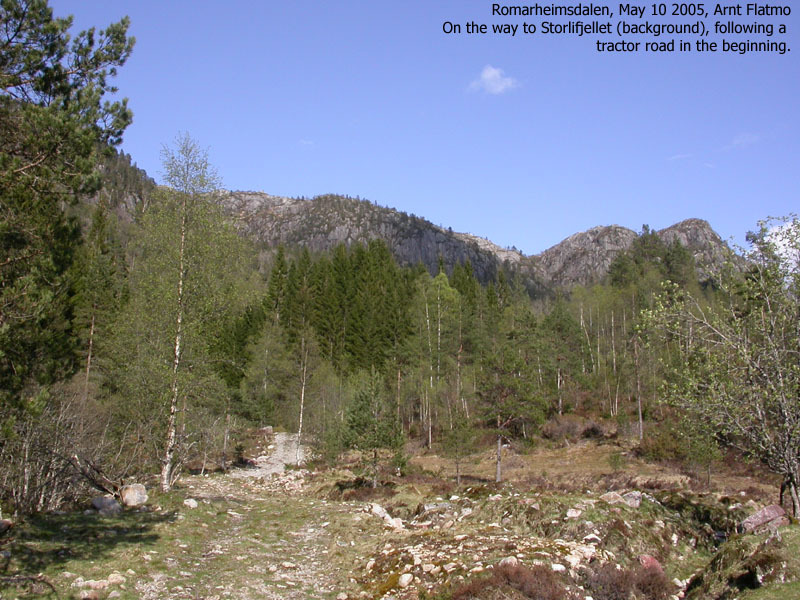 The trail down Langedalen is very easy to follow. Once down at the highway, you have the 550m up to Nymark ahead of you before you can get in your car. 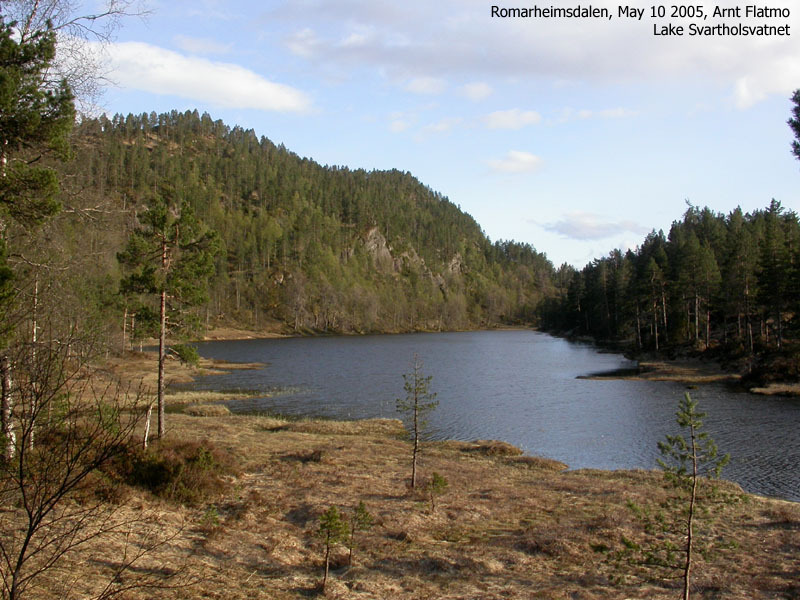 The list of remaining mountains and forest hills in Lindås was getting shorter and shorter. Only 3 more tops to do, and this Tuesday evening I would visit Storlifjellet. The weather seemed to stay good although some very dark clouds made me bring along extra clothes. My good contact Anders Stusdal up in Stusdal had explained the best route up to Storlifjellet and suggested that I hike down via Eiterdalen. And this was the plan when I left Nymark 17:35PM. 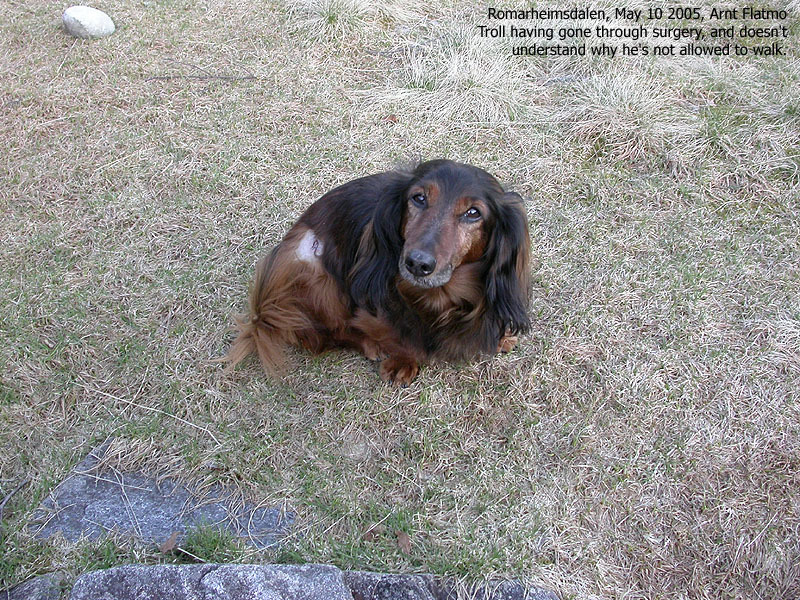 Troll had gone through surgery and the vet's order was that he should rest. So he was to remain in the backpack throughout the hike and it was to difficult to explain to the little one why he wasn't allowed the walk. Dogs make the same sounds as humans when they are really, really disappointed. It can be heartbreaking sometimes. For both parties. Finding a good and doable route up the mountain wasn't difficult. The wind on the mountain was awesome and I had to tie down all straps, as they were seriously whipping the dog's face. We reached the summit 18:30PM, so we had made it up within the hour. The dark clouds caused deep shadows to fall on the mountains, and the pictures weren't good. I quickly moved on and on the way down from Husafjellet it was raining light. It looked like a massive thunderstorm was moving in from the north, but it never amounted to anything. 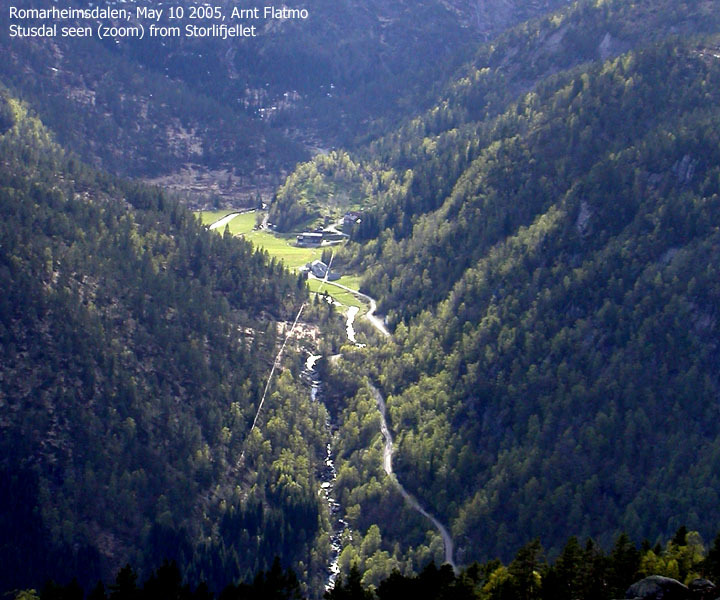 In fact, the weather turned better and better as I was heading down Eiterdalen. I liked the walk down Eiterdalen. There was a river and there was a large waterfall. There were surprisingly large meadows in the middle of the forest and I liked the trail. No red paint, no trailsigns, no nothing. Just a plain good old rocky and muddy trail. I felt very much alone in this forest, although I could see footprints in the mud. I would assume the locals cherished this area and that I wouldn't get surprised if I bumped into someone. But perhaps not 20:00PM on a Tuesday evening. When I reached the highway, the road was blocked. Yet another car had driven off this road. That happens "all the time", and I wonder why. The road is narrow, but still.. We were back at the car 20:25PM and I was JUST able to get on the road before a convoy of cars were allowed to proceed on the highway.